Raisins are dried grapes and they are generally produced from seedless grapes. The dried grape has a world wide user market. It is commonly eaten out of hand; mixed into foods like oatmeal, granola bars, and chutneys; and used in cakes, pies, and other baked goods. 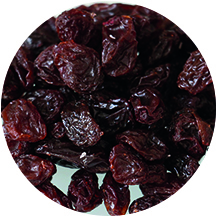 Raisins are a dense source of mineral like calcium, iron, manganese, magnesium copper, fluoride, and zinc. Because raisins are rich in carbohydrates, especially natural sugars, they give a quick boost of energy and are a good source of dietary fiber. Raisins, , contain lower levels of vitamin C, folic acid, carotenes, lutein and xanthins than fresh grapes. They can be eaten as a snack. Added to bakery items like chocolates, cookies, muffins, bread, puddings, biscuits, cakes, waffles, and so on.